"Sweaty! 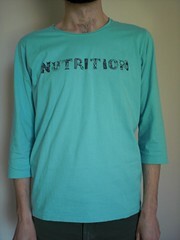 Summer Tshirts Launch at Kichimu"! We had an exhibition and a Storytellers performance with Toyama Takeo last summer at STONE, located in Kichijoji's Kichimu, and it is our great pleasure to work with them again! Plus, the other folks involved in the show make some truly amazing stuff. Spoken Words Project, Sunui, Toraneko bonbon, anuenue, Jubilee, Boojil, Kazuho Oogiya, among others will be designing shirts along with us! Summers in Japan are super hot and heavy with humidity and this Tshirt launch will hopefully help to alleviate the sweaty oppression and lift spirits! We are doing our best to come up with some refreshing and ridiculous designs! The tshirts will be on display on the following dates: 8/12, 8/13, 8/14, 8/19, 8/20, 8/21 and available for purchase or order during these times or anytime afterwards. Here's a little something we meant to put up a long while ago, but we got caught up and distracted in other things! 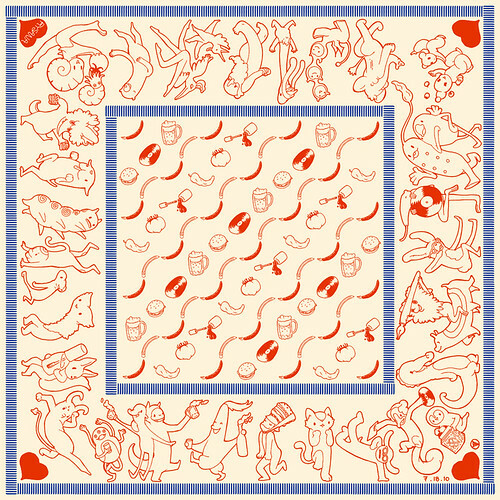 It's a handkerchief design we created for our friends' wedding. Their marriage was July 2010 and held in Tokyo, just after we arrived. They asked us to include some things they liked which is why records, pens, burgers, peppers, tomatoes, nail polish and beer is everywhere. 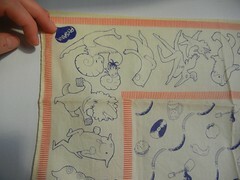 The hankies were included in the gift bags every guest received. They are old and very dear friends of ours and it was a great honor to be a part of their wedding in this way, especially since we live so far apart these days. At the moment we've only been selling them at the venues we've been performing at, but if you are interested send us an email! The shirts are currently selling for $25. Colors are mint green, yellow and light orange. More stuff has arrived! 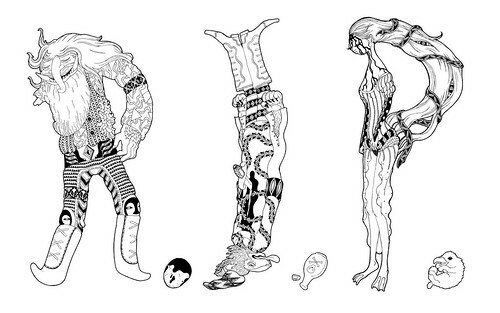 This time it's some of the shirts we designed for UNIQLO in collaboration with Gestalten. They are really lovely in person, especially the women's as this was our first time checking it out. Now just waiting to get our hands on the other women's tee! Thanks Junko and UNIQLO and Gestalten! Goods! Stuff! Today the R.I.P. tees we designed for KASINO landed on our doorstep! They are great! And still available on the KASINO site! Here's a better view of the original drawing. Stay tuned for more great stuff from these guys! Also, next to the tee is a KiraKira bag! It was made by KiraKira! And it also arrived recently with some KiraKira tshirts and cds! We're looking to sell these bags and shirts - hopefully when we have another Storytellers event of some kind or if you are interested just send us an email! The image on the bag is the Bless section of the map/liner notes we created for KiraKira's Our Map to the Monster Olympics! 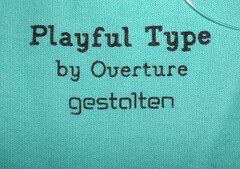 Just some details of one of the shirts with our design from the Uniqlo Playful Type collection - now that we have one in our hands that we can explore. Neither of the colors showing up in these photos is quite accurate though. It's sort of a mint. UNIQLO shirts designed by Overture! Now! On the UNIQLO website! In Japan! There are two up at the moment actually, with a third coming in March when the line is properly scheduled to be released worldwide. Right now they are only available on the Japanese site and a few locations in Japan. The shirts are part of their Playful Type line, working with publisher Gestalten and the designs from the book of the same title, Playful Type: Ephemeral Lettering and Illustrative Fonts (hardcover currently sold out apparently, softcover available here). The lightgreen men's shirt below uses an illustration of ours, originally appearing in Issue #6 of KASINO A4 and then picked up for inclusion, among similar designs of ours, for the Gestalten book. The shirt is currently only available here, on UNIQLO's Japanese site (and a few select stores), but as stated above, will be out worldwide in the Spring. 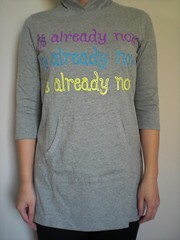 The women's hooded sweatshirt below is one of two other designs of ours used for the Playful Type line. 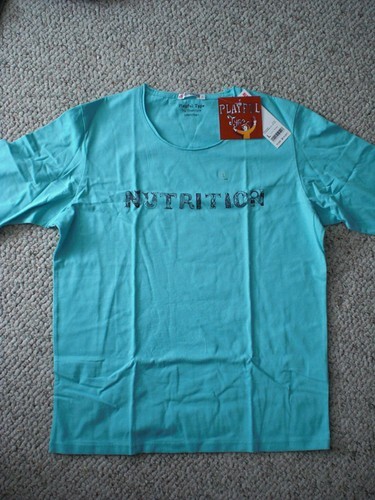 These were by request of UNIQLO after the NUTRITION design was selected, with the text and arrangement UNIQLO's planning and the just handwritten design Overture's doing. Again, this shirt is available here on the Japanese site at the moment with it and a similar design seeing a worldwide release some time in March. This bit of news slipped through our fingers in the holiday blizzard but we received KiraKira tees! They sold out at the show we went to but our new friend Sid who trucked around with KiraKira during the tour brought us a pair of the shirts on his way up to Montreal. 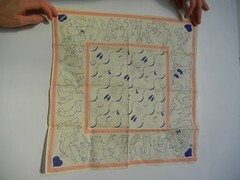 These were hand printed by KiraKira and the design is of the minimonster ep we drew up in late 2007! A masked gremlin cranking out a parade of monsters from his gramaphone! So thanks KiraKira and thanks Sid! 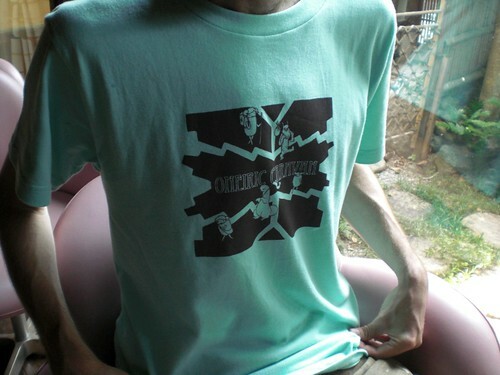 FatCat Overture T-shirts in USA! I'm up at 3:30 AM this morning to pick someone up from the airport, so Aya and I are on different schedules. 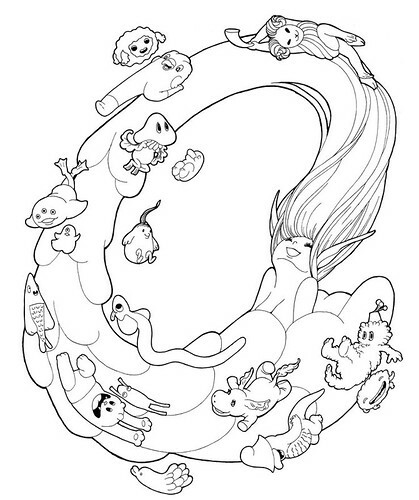 Apparently, without my knowledge she learned of a tshirt design of ours that just went on sale at Graniph in Japan. The design is of the spirit of the Yamabushitake Yeah's fallen leader on a bright pink ground. Very effective. Unfortunately, the English site is still in development, but the Japanese page you can checkout here. The Overture Knotted Tower T-shirt we designed arrived from Poketo! 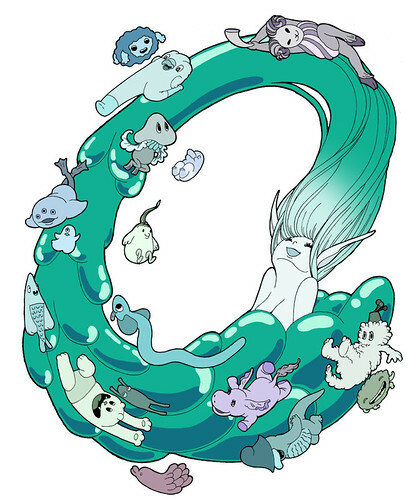 Checking the latest news at Poketo today, we saw that our T-shirt design has been released! The design is of the Knotted Tower, the great tree that is Overture's website lookout (currently still covered in snow). 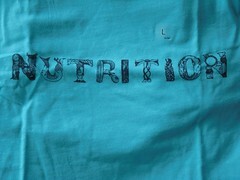 A simple design when compared to others available but it was certainly no small feat preparing the design for printing. If you want to purchase the shirt or look at the selection of other awesome goods they have, please head over to the Poketo website!